As part of the 2015 POPSUGAR Insights Food study, we surveyed female visitors to POPSUGAR to better understand their grocery-shopping and entertaining habits. Overall, we found that 49% of women entertain friends or family at home at least once in a typical month, with 16% of women saying they entertain 3+ times per month. When entertaining at home, 63% of women choose to serve a combination of new recipes and those that they've cooked before. Twenty-seven percent of women stick to tried-and-true recipes that they've cooked before, and 4% choose to serve prepared foods that they heat and serve. 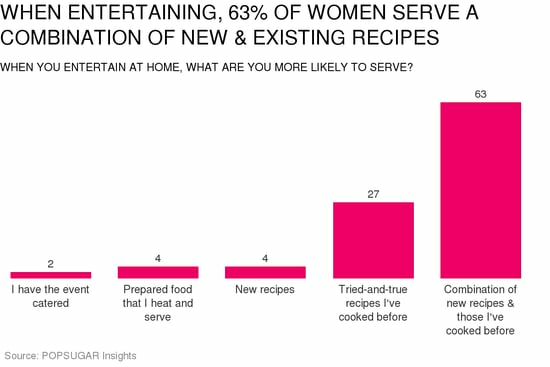 Only 4% of women we surveyed are daring enough to serve all new recipes, and a very lucky 2% of women decide to just have the event catered!